Our fourth book is entitled "Stencilists Pochoiristes". 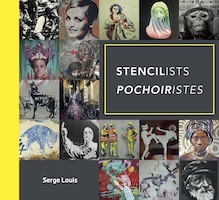 Produced by Serge LOUIS, this book collects interviews with 17 American and European artists who are using the stencil technique as their means of expression, either in the streets or in the galleries. Based on a set of 13 questions, the book investigates several issues related to the existence and expansion of urban art. The book includes 444 pages and 273 illustrations. Its foreword is written by graffiti expert Samantha LONGHI and its afterword is signed by Serge LOUIS. Texts are presented in bilingual EN/FR format. The book is available at the price of 38€ including VAT + shipping cost. 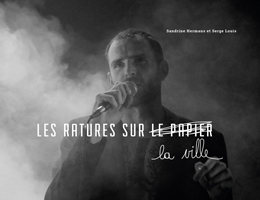 Our third book is entitled "Les Ratures sur le Papier". Written (in French !) by Sandrine HERMANS and Serge LOUIS, this book sets a parallel between the trajectories of rap artist MOCHELAN and his native city of Charleroi around the issue of whether a post-industrial city can be redynamized by art and culture. The book contains many pictures of MOCHELAN and Charleroi as well as interviews of ten major contributors to the local cultural scene. Its afterword is written by Paul MAGNETTE. Our second book is entitled "DJs et DJettes à Bruxelles". Written (in French !) by Serge LOUIS and Sandrine HERMANS, this book investigates the current status of the electronic music scene in Brussels via interviews with both established and emerging DJs. Topics like the pertinence of being a producer and the future of vinyl records are discussed. The book is enriched with numerous portraits of artists. Its foreword is contributed by Laurent GARNIER and its afterword is from AGORIA. Our first book is entitled "Pochoirs et Pochoiristes à Bruxelles". Written (in French !) by Serge LOUIS and Vanessa SUTOUR, this book approaches the vibrant graffiti scene in Brussels via interviews of urban artists who are using stencil templates as medium. The book is illustrated with more than 400 pictures of stencils found in the streets of Brussels and its foreword is by Samantha LONGHI. © Mædia sprl. Mentions légales. Design: Synthèse.